Dr Gidda helped create the perfect smile for me. 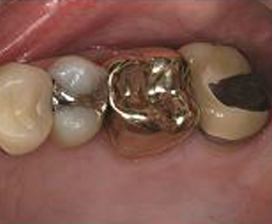 Are you self-conscious about worn, chipped or broken teeth? Is the colour of your teeth making you too self-conscious to smile? Have your teeth become increasingly discoloured over time? Do you intentionally shy away from the camera or find yourself smiling without showing your teeth? Would you like to whiten your teeth for a special occasion or perhaps your wedding day? Do you have large fillings that are worn, broken or discoloured? Do your crowns no longer match the shade of your natural teeth? 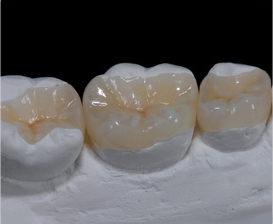 Are you embarrassed by the dark grey line around the edge of your existing crowns? Would you like to replace your metal fillings with cosmetic, 'white' alternatives that match the colour of your natural teeth? If any of these issues are preventing you from smiling or affecting your self-confidence, we can certainly help you. Firstly, you are not the only one who thinks twice about smiling in front of other people or the camera. Up to 80% of the UK population suffer from this problem. The good news is that at Omnia Dental Spa we understand the importance of a confident smile and we appreciate the impact that it can have on both your social life and career. The professional team at Omnia have helped transform the smiles of thousands of clients, just like you, with life-changing benefits. Our team will always discuss the various treatment options that are available to you and then recommend the most appropriate solution for your individual dental problem. We will always endeavour to get you smiling with confidence! Inlays and onlays are a durable and aesthetic method of restoring a tooth that has been weakened, fractured or damaged by dental decay or an accident. 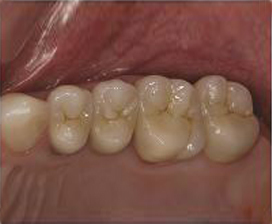 Inlays are used when the raised cusps of the tooth are not damaged. 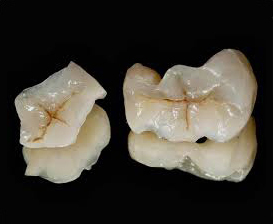 In contrast, onlays are provided when one or more of the pointed cusps of the tooth have also been damaged, therefore, onlays generally tend to be larger restorations than inlays. If a considerable proportion of the tooth is damaged, or if the tooth has had root canal treatment (also known as a root filling), a dental crown is usually the best option to preserve and protect the remaining tooth. The diagram below illustrates the differences between a dental inlay, onlay and crown. At Omnia Dental Spa all of our Emax (porcelain) inlays, onlays and crowns are carefully crafted by our very experienced and talented team of master dental technicians. 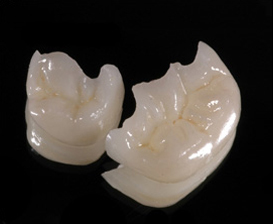 Each restoration is bespoke and is handmade to fit your individual tooth. The shade of the restoration is precisely matched to the natural shade of your teeth to ensure the best possible cosmetic result. In fact, the results are so life-like that it is often impossible to tell that the tooth has been treated at all! Call us today on 01564 822 224 if you would like to learn more about how porcelain inlays and onlays can be used to restore your teeth to their natural appearance. 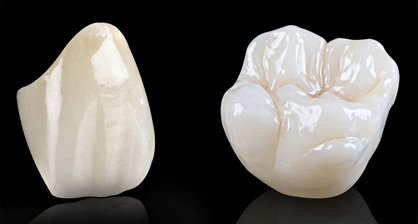 The replacement of traditional metal fillings and crowns with Emax porcelain crowns can produce a dramatic cosmetic improvement to your smile. 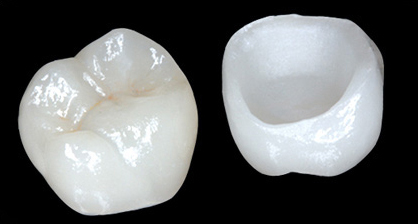 The all-porcelain restorations are more natural and life-like as they allow light to pass through them in a similar manner to a natural tooth. This lady was very self-conscious about the appearance of her heavily filled and discoloured teeth. Two Emax crowns were used to produce a dramatic cosmetic improvement and she was delighted! Call us today on 01564 822 224 if you would like to learn more about how Emax crowns can be used to enhance your smile and restore your teeth to their natural appearance.